Lochte Feed & General Store in Fredericksburg, TX has all your winterizing needs including heat lamps, hay, bedding, feed and supplements. 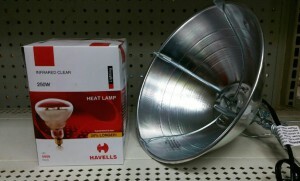 Keep the heat lamp above the height of your animals so it does not burn them. Place the lamp 18 inches away from anything that may catch fire. Do not place hay under the heat lamp for the risk of falling on the hay causing a fire. Contact Lochte Feed with additional questions or concern you have regarding winterizing your animals. We have a huge selection of feed, ranch supplies, pet supplies and show supplies. This entry was posted on Wednesday, December 7th, 2016 at 12:08 pm	and is filed under News & Updates. You can follow any responses to this entry through the RSS 2.0 feed. Both comments and pings are currently closed.